OK this is a political post. You might infer something about my political leanings from this, and you might classify me as a “deplorable”, but I run that risk. I don’t like the way our politics is turning out nowadays. You are free to interpret “our” and “nowadays” in whatever way you want. What I don’t like is that people seem to wear their political beliefs on their sleeve, and think it is okay to shame and cut contact with people who don’t share their beliefs. I don’t know when exactly this started – but it was surely sometime between 2013 and 2016. The culmination of this attitude was US Presidential candidate Hillary Clinton describing her opponent Donald Trump’s supporters as a “basket of deplorables“. And that attitude seems to be being taken forward by people of various political dispensations three years on. I long for the days when people treated their political opinions like their private parts – stuff that existed and was put to good use when required, but not put on display. Nowadays, though, trawl through any social media platform, and you find people making political statements all the time. If you aren’t in a filter bubble, you will surely be seeing flamewars. And a difference in political opinion is no longer just a difference in opinion – you consider someone with differing views as despicable. I’m friends with a lot of people who hold strong political opinions, and whose opinions might differ from mine. I don’t care about it – since there is plenty to them otherwise that makes them valuable to me, and so I continue to hang out with them. Some people, on the other hand, don’t think like this. According to them, some political positions are so horrible that anyone who endorses that position is necessarily a horrible person, and not worth engaging with. For them, their political axis is fundamentally uni-dimensional – the world doesn’t exist outside of the dimension that they consider to be a dealbreaker. As a consequence, any stand endorsed by a politician who endorses their dealbreaker position also becomes a dealbreaker. Political commentary and evaluation is based on who takes the stand, rather than the stand itself. Everything is seen through a political lens, and anyone who disagrees with them is worthy of ridicule. It is sad that politics has taken over our lives so much, and people consider other people’s political opinions as such an important part of their lives. And the way social media and feedback loops work, I see no way out of this. The bigger switch happened as a national market for consumer goods opened after the Civil War, when purveyors like department stores wanted to reach large urban audiences. Newspapers responded by increasing the number of ads relative to content, and switched to models that went light on the political partisanship in the interest of expanding circulation. This move was driven not exclusively by lofty ideals but also by mercenary greed. And it worked. Newspapers used to make lots of money. Mountains of money. Basically, the move to objective journalism came in the late 1800s when advertisers such as Macy’s wanted to take out full page ads, and wanted to do so in newspapers that served the largest sections of the market. And when a newspaper had to reach a large section of the market, it inevitably had to tone down the partisanship, and become more objective. Over the last decade, we have been witnessing (across the world) the decline of objective media. All media is “#paidmedia” based on which side of the political spectrum you stand on. There aren’t that many truly objective papers around, and social media is bombarded left and right by extremely politicised reporting that goes as “news”. It is perhaps no coincidence that this period has coincided with a time when print circulation has been dropping steadily (in the developed world at least), and where online advertising can be highly targeted. In theory, mass marketing is inefficient. When you pay to put up a hoarding somewhere, you’re possibly paying a small amount for each person who sees the hoarding, but not all of them might find it interesting. Consequently, this reflects in a depressed per-person price of the hoarding implying the owner of that real estate can’t make as much as she could if the hoarding were to be more “targeted”. When you can target your advertisements more precisely, everybody wins. You as the marketer know that your advertisement is only being shown to your intended audience. The owner of the real estate where you put your advertisement can thus charge you more for your advertisement. Even the customer will be less pained by the advertisement if it is highly relevant to her. Another way of seeing it is – an advertisement shown to a customer who doesn’t want to see it is wasted. The monetary cost of this waste are borne by the owner of the real estate and the advertiser, and the non-monetary cost is borne by the customer (being forced to see something she didn’t want to see). And so one of the biggest technological problems of today is on how we can target advertisements better so that we can minimise such costs – and in the last decade and half, we’ve made significant progress on that front. The problem with greater efficiency, however, is that it comes with the side-effect of biased media. 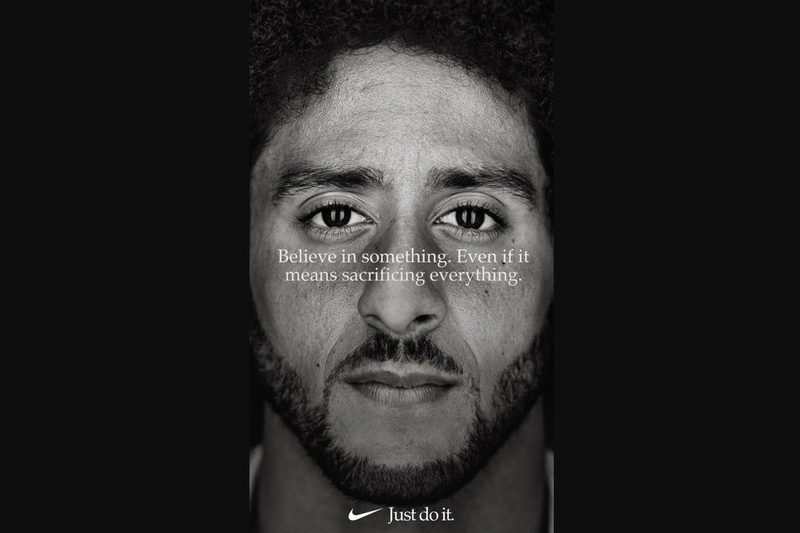 When Nike knows that it can precisely target an advertisement at American leftwingers, it makes an ad with Colin Kaepernick and shows them to American leftwingers to sell them more shoes. This doesn’t however, mean that Nike only sells to left-wingers. The same company can make another advertisement targeted precisely at right-wingers and use it to sell shoes to them! So now that you can make left-wing and right-wing ads, and you have the ability to target them, you want to cut the waste and place the ads so that you can target as best as possible. In other words, you want to place your left-wing ads in places that only left-wingers want to see, and right-wing ads only in places that right-wingers will see. And so you prefer to advertise in CNN and Fox rather than in a hypothetical “broad market” media outlet. And the reason you created the politically charged ads in the first place was because there were some outlets (Facebook, for example) where you could precisely target people based on their political orientation. And so you see the vicious cycle – that you can target in some places means you want other places where you can target and that creates demand for more polarised media. It was the opposite cycle that took effect in the late 1800s and early 1900s. There was no way brands could target (also, when you make physical advertisements, with 1900s technology, each advertisement is costly and you don’t want to make one per segment) too effectively, and so they went mass market in their communication. And this meant advertising in the outlets that could get them the maximum number of eyeballs. When you can’t discriminate between a “right” and a “wrong” eyeball, you pay based on the number of eyeballs. And the way for media organisations to grow then was to cater to everyone. Which meant less less bias and more objectivity and more “features”. Sadly that cycle is now behind us. It’s been a while since I wrote a post like this one – I remember a decade ago, I used to flood my blog with such stuff. While individual Indians seem to have done well over the past decade, India is more or less where it was. Worse, politics and policy priorities seem to have regressed to 1989. Reading through the article (I encourage you to read it, it’s good – never mind the headline), I found a clear and distinct pattern in the kind of things where things have gotten better in India and where things have gotten worse. Everything where markets function, or where the government doesn’t have much of a role, things have changed significantly for the better. Everything where the government has an outsized role, either because it is the government’s job or the sector is overregulated, things have gotten worse. So our cities have gotten more crowded. Infrastructure has gotten worse. Law and order has regressed. And this has had little to do with the party in power – whatever the government touched has regressed. Looking at it in another way, Indians seem to be highly capable of making their lives better by coordinating using the invisible hand of the market. However, we seem incapable of making our lives better by coordinating using the government process. From this perspective, there is one easy way to progress – basically reduce the government. Get rid of the overregulations. Get the government out of things where it shouldn’t be. Give a freer hand to the market. Unfortunately, ahead of general elections this year, we see most parties taking a highly statist line. This is a real tragedy. I recorded a podcast for Pragati on opinion polls, exit polls, election forecasting and all such. You can listen to it right here, or on the podcast page here. The Pragati Podcast is available on all major podcast apps. My first exposure to political ideologies took place in 2004, when I joined the now-defunct (but then brilliant) social networking site Orkut. While filling up my personal details, I was asked to pick my political beliefs from a drop-down. It had things such as “left-liberal”, “very left-liberal”, “right-conservative”, etc. Now, while I considered myself liberal back then (I’ve moved far more liberal on personal freedom issues since then), there was no way I could describe myself as “left”, since I’ve always been a free market fundamentalist. Finally I noticed there was something called “libertarian” in the dropdown, and assumed it might stand for my beliefs and chose that. In hindsight, it turns out I was right (no pun intended). A year or two later, I got introduced to a “libertarian cartel” (I was never a member, so don’t know who were members). Presently, I was invited to join some of them in discussions, and my love for the libertarian philosophy grew (these discussions were instrumental in me moving far more liberal on personal freedom issues). Yet, looking around the political spectrum, you had few libertarian parties (going across countries). You had the set of parties that can be broadly classified as “Republican” which allowed you to do business the way you liked, but sought to restrict personal freedoms. And there were the parties that can be classified as “Democrat” which promoted personal freedoms, but restricted how you could do business. And you had philosophies such as communism which sought to control both. The “fourth quadrant” was (and is) largely empty. It is not hard to understand why this fourth quadrant is empty – in exchange for responsibilities of governing, politicians desire power, and this power can only come at the cost of restricting freedoms of the constituents. Different political formations choose to exercise this power along different axes, but little differentiates them – they all seek to control. While libertarianism is appealing for the constituent, it doesn’t make sense for politicians since it doesn’t compensate sufficiently for the responsibility of governance. Hence you don’t find libertarian political parties. Yet, we find that slowly but surely, reforms do happen. Over time, restrictions on freedoms (both personal and economic) do get relaxed, albeit at a glacial pace, and this is true across countries, despite there being no “libertarian” politicians. Why does this happen? The simplistic answer is that politicians in functioning democracies have to face lengthy periods of time in opposition, when they are at the mercy of the party that is then in power. Since politicians tend to be vindictive animals, you don’t want to leave behind any laws that might be used to harass you while you are out of power. So the ruling party should tend to ease restrictions that can be used against its members when they are out of power. Again, this is fine in theory, but why does it not always happen? The answer is that opposing political parties are not “orthogonal enough”. If politicians on multiple sides of the divide have broadly similar ideas on certain issues, there can be a tacit understanding (a “doctrine of no first use”, perhaps) to not use the laws that they agree on against each other. When you have parties that have orthogonal philosophies, you can expect them to do their bit while in power to undermine the sources of their rivals’ control, so that their rivals might enjoy less control the next time they are in power. And citizens in such democracies are likely to enjoy greater freedoms. As the old saying (paraphrased) goes, “when politicians from all parties agree to something, it is unlikely to be in the interests of the people”. Recently, Vijay Nair, CEO of OML Entertainment, which organises the popular NH7 Weekender music festivals, tweeted that the Weekender in Delhi last month was the first where he didn’t have to pay a single paisa of bribe. Thank you Delhi. Not a single ? bribe paid for an event of this magnitude. Never thought that’d happen. Can get used to this. Just before the event, Delhi Chief Minister Arvind Kejriwal gave a speech in which he stated that he had bought passes for the event by paying for them, and urged his ministers and other government officials to do the same rather than asking for freebies. Yesterday the Delhi government increased salaries of its legislators and ministers by a factor of four (which the Economic Times incorrectly reported as a “400% increase” – it’s a 300% increase). The basic monthly salary of Delhi MLAs and ministers is all set to go up by a whopping 400 per cent besides significant hike in a slew of allowances with the assembly today approving a bill to effect the increase considering rising cost of living. The move to increase Delhi legislator salaries has been expectedly panned by opposition parties, but it is an important step in reducing corruption, the main plank on which the Delhi government came to power last year. In order to better understand this, go back to Kejriwal’s statement before the Weekender urging officials to purchase their tickets and not ask for freebies. The on-ground price of a ticket for the Delhi Weekender was Rs. 3500. As per existing salary structures, a Delhi MLA would have had to spend a quarter of his monthly basic salary for the event. If he were to buy tickets for his family of four, he would have to spend his entire monthly basic salary (I understand there are other components of compensation, too)! And this would have been good enough justification for him to ask for free tickets. While a higher salary might still not prevent an MLA from demanding free tickets, his earlier moral justification for the demand doesn’t exist any more – since the new salary structure now makes the tickets affordable. This removal of moral justification is certain to have an impact on corruption at the margin. More importantly, official salary levels have a massive impact on the kind of people the profession attracts. When you get paid a pittance as a politician, it repels people who are loathe to be corrupt – for it is next to impossible to make a decent living on such salaries. People will be loathe to leave well-paying jobs for politics, and the only people politics will attract are those that hope to make money on the side. I hope the Centre approves the Delhi government’s proposal to increase salaries, and other states match this. Given the small number of legislators and ministers, fiscal impact will be marginal. But the impact it can have on corruption, in terms of removing the moral justification, and on the kind of people it will attract to politics will more than pay for this. So a couple of years back, just before the Karnataka Assembly elections, I had taken a look at Gerrymandering within the constituencies of Bangalore. This picture shows the boundaries of the parliamentary constituencies in the city, and you can see that it is bizarre. For example, parts of the Bangalore North parliamentary constituency (black) lie to the south of all of Bangalore South constituency (green)! Now, the word “gerrymander” was invented in the 1800s, when one Mr. Gerry, who was the governor of Massachusetts, redrew the districts (constituencies) in the state in order to maximise the chances of his further election victory, and the redrawn districts looked like some kind of a mythical creature, which was given the name “gerrymander”. Now, while the Bangalore figure above looks bizarre, no doubt, it doesn’t really resemble any animal, mythical or otherwise. However, with the proposed BBMP Restructuring, Bangalore’s wards are in the news again. And I was just looking at the population densities in different wards, and happened to take a look at Padmanabhanagar, which is my current assembly constituency. And this is what it looks like (different components are the different wards within the constituency, and intensity of colouring indicates population density within these wards). Yes, really, that is the shape of the Padmanabhanagar assembly constituency. If you have any doubts, get the data from http://openbangalore.org and check out for yourself (that’s where I got the mapping data from; density data came from the BBMP Restructuring site – there’s a link there with excel file on areas and populations). Anyway, so what do you think Padmanabhanagar looks like? To me, this looks like a hen that is running. To Thejaswi Udupa, with whom I shared this picture, it looks like a “hen doing ballet”. Whatever it is, such gerrymandering leads to atrocious policy and implementation. My house, for example, is very close to the beak of the hen described above. In other words, it’s in one extreme corner of the constituency. Actually, if you look at the portion forming the hen’s head, that’s Yediyur ward, and my house is at one extreme of Yediyur ward, too. The road outside was dug up a year and half back and hasn’t yet been asphalted. Stone slabs covering storm water drains were removed four months back for desilting and are yet to be placed back. And because we are at one extreme edge of both assembly and BBMP constituencies, neither MLA (R Ashok) nor corporator (NR Ramesh) bothers. If there were no gerrymandering, there wouldn’t be any “extreme corners” like this one. And that would mean less chance for elected representatives to ignore certain parts. And that would lead to better governance!